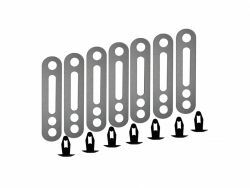 The unique design locks virtually any peg hook regardless of size, shape or manufacturer. You can use the Peg Strapper system with any ¼” pegboard system, including the ultra-tough Holey Rail™ to hold the heaviest loads. These peg strappers worked wonderfully for my metal peg board; wish I had found them years ago!! Keep up with The Holey Rail!